fingers too, (like eyes) are ganglia of the brain, nodes on the loop of thinking, hands-on driving a Hoop-of-Mind. they are a loom. a confluence of mindful practice and wholeness describes my ideal experience of making art. it can occur if I am watchful in meeting my subject, and open in my responses to what I learn. then, I work receiving honor from my subject—and through it, intimacy with the World. this is the feeling of being near to God when the self is given over to creative work. ● Technique and craft form a language of technical and structural operations that is integrated, selective and specific; for me, it must also be improvisational, resilient and personal— play subverts economy— ● Materials have Voice that carries information, both for the senses and of the culture (meanings). Tensions of Voice within a weaving can excite curiosity, suggest narrative, and express the conditions of their making. ● Interplay of line and space takes on energy when articulated via the structural nature of tapestry. The action of an independent line on a field of color, like leading in a glass curtain wall, establishes the field as skeletal nexus, or source, of an organic fluidity. A line of color can be drawn as a directional thread within a bedding of weave. Or generally, the character of tensions between action/event and surface is defined by medium. ● Works of intimate scale own certain vitality— especially when taken together with the experience of holding an object in one’s hand. ● The dynamics of rectilinear geometry are inexhaustible: think of the generative potential of a folded-down sheet of paper, as for a printer’s octavo …. ● Warp and weft define an architecture of right-angled pattern and format; a variables that express Light (density, depth, saturation), combined with relaxed contours, releases that fluidity among the threads of the loom. When the grid is permitted, it breathes and arrives, either at its own undoing… or at its ultimate perfection. The formidable Grid is a rigging of light. Out of the center, mid-century, Midwestern beginnings—I am fascinated by edges, cusps, the ripples where forces converge. In my art the edge is a physical event, an energized fusing of surfaces, gesture and light. In tapestry, the possibilities for creating surfaces and edges in tension are salient, given the medium’s essential linearity, and the direct, yet fluid invitation of its uncomplicated structure. My tapestries are small in format and bas-relief, hanging flat against the wall. My repertoire of improvisational tapestry techniques includes supplemental warps (and wefts) on- and off-loom; layering, tacketing, piecing, strips and needleplay with mixed natural and synthetic threads, pre-woven fabrics and silk ribbon. The works can be described as delicate, fine, “painterly”, colorist, organic, spontaneous, intensively worked and craft-conscious. Their imagery is often non-objective with references to the experiences of motion and memory in landscape. Tapestry weaving engages this concept in certain appealing ways—the reflex of thread in the selvedge, the rise of the weft around grooves in the air; and exceptionally, the possibilities for splicing-in beams at diag- onals, setting skewed patterns of warps, and ‘kite-stringing’ shapes in layers— fused, dove-tailed or floating—a geography of forces in dynamic constraint. 〉 Tell me anything you want me to know about what you did and how you have thought about it. Colorado’s Big Thompson Canyon—color, texture, fissures, light and time. I sketched these same rock faces from the passenger window of a moving pickup truck for almost 2 decades, before the year 2013 brought an ocean over the mountains and the canyon tumbling down. 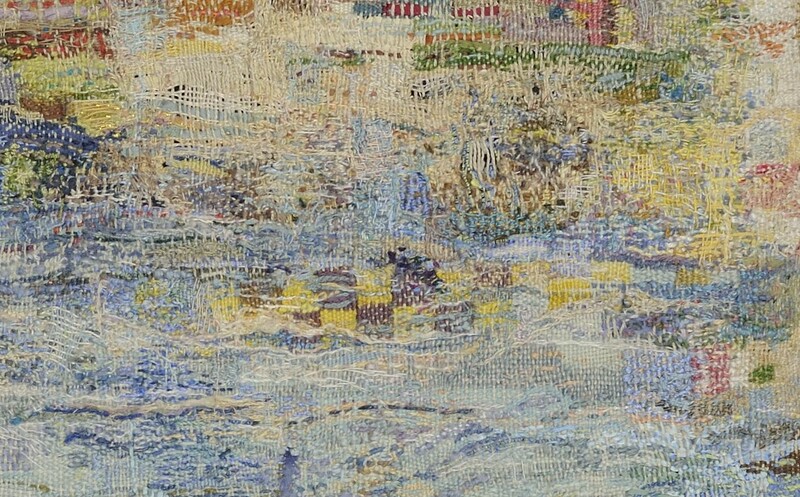 While my sketches—interconnecting lines of distinct colors–record quick percep- tions of a landscape in overlays, a tapestry weaving is a long-term engagement—a lingered-over, internalized, selective distillation that reveals a story of associated ideas and experiences, which expand through the time of a weaving’s creation. And it necessitates seeing everything in terms of mass. The materials used in Granite Lace are cotton, linen, silk, wool and synthetic threads and silk ribbon. I describe my tapestry technique as an improvisational mix incorporating wrapping, stitching, darning and crochet in the weaving. Granite Lace is a strip-weaving assembled from at least 7 parts that are joined with warps abutted or set perpendicular, as well as supplemental matrix threads, which form connective wedges between the strips.The idea of the organic matrix* is central to my tap- estries. In Granite Lace, the imagery, idea and method of construc- tion, and importantly, their fusion through creative development, are evidence of this metaphor in action. 〉 Could you say which of the categories (of those laid out in the Call for Entries—“Attention to the Process of Weaving” or “Exploration of the Elements of Weaving”) your work fits? You may well have a different sense of it from mine…. Although either category description could include technical purism, or virtuosity, inspiring in itself and drawing upon measures of tradition and precedent—both suggest to me the kind of virtuosity that sets up its own measure and plays on, and against, the old standards— elaborating and renewing both the form and the story by means of the making, what I might call the “idiosyncratic thinking hand”. My sense is that Granite Lace belongs to the first, because of the connection of process to “story”—always a function of the process of my work. And while I enthusiastically (if iconoclastically) explore the elements of weaving, this is an occurrence of process, rather than a projected end.